Bharat Coking Coal Limited (BCCL) a Mini-Ratna Company, Govt. of India Undertaking engaged in Coal Mining activities invites applications from for the posts of Staff Nurse ( Trainee), Technician (Audiometry) ( Trainee), Accountant¸ Pharmacist ( Trainee) etc. Eligible Indian citizens who fulfill the prescribed qualifications, age, experience etc. can submit online application toward the latest BCCL Recruitment 2015 Employment Notice No- 08/2015 Recruitment of Para Medical Staffs & Accountants. There are total 248 vacancy of Para Medical Staffs & Accountants. Staff Nurse (Trainee) – T&S Gr. C Minimum Educational/Technical Qualification: 10+2 plus ‘A’ Grade Nursing Diploma or Certificate from a recognized institute approved by the Government. Jr. Technician (ECG) – T&S Gr. D Minimum Educational/Technical Qualification: Higher Secondary (10+2)/Intermediate & two years’ experience certificate as ECG Technician in a hospital under a Cardiologist/Physician or in a reputed Nursing home having ECG service under a Cardiologist/Physician. Preference shall be given to graduates and to those who can handle running repair of the equipment. Technician (Audiometry)-Trainee – T&S Gr. D Minimum Educational/Technical Qualification: Higher Secondary (10+2)/Intermediate plus Diploma in Audiometry from Govt. recognized Institute. Technician (Refraction/Optometry)-Trainee – T&S Gr. D Minimum Educational/Technical Qualification: Higher Secondary (10+2)/Intermediate plus Diploma in Refraction/Optometry from Govt. recognized Institute/Govt. Hospital. Technician (Dental) Trainee – T&S Gr. D Minimum Educational/Technical Qualification: Higher Secondary (10+2)/Intermediate plus Diploma in Dentistry/Dental Technology from Govt. recognized Institute. Physiotherapist (Trainee) – T&S Gr. C Minimum Educational/Technical Qualification: Diploma in Physiotherapy from Govt. recognized Institute (minimum 3 years course). Technician Dietician (Trainee) – T&S Gr. C Minimum Educational/Technical Qualification: Recognized Diploma in Die tics. Technician (Pathological) –Trainee - T&S Gr. C Minimum Educational/Technical Qualification: Diploma in Lab Technology (Pathological) from an Institute recognized by the Government. The Technician Para Medical Staff who are matriculate and who have served in Army for a period of at least 10 years prior to retirement shall also be treated as possessing the desired qualifications laid down for the post of Technician(Pathological)-Trainee in T&S Grade-C. After successful completion of one year training, they will be regularized as Technician (Pathological) in T & S Grade-C. Technician (Radiographer) -Trainee – T&S Gr. C Minimum Educational/Technical Qualification: Diploma in Radiography from an Institute recognized by the Government. The Technician Para Medical Staff who are matriculate and who have served in Army for a period of at least 10 years prior to retirement shall also be treated as possessing the desired qualifications laid down for the post of Technician (Radiographer) -Trainee – T&S Gr. C.
Pharmacist (Trainee) – T&S Gr. C Minimum Educational/Technical Qualification: 10+2 with science and Diploma in Pharmacy registered with Pharmacy Council under Pharmacy Act. 1948 with valid registration. Accountant – T&S Gr. A Minimum Educational/Technical Qualification: Intermediate Examination of ICWA or CA. 13 years for PwD/ PH (OBC) & for others as per rules. Payment of application fee can made through “SBI-i -Collect option” with SBI Internet Banking, other major bank’s Internet Banking, Debit, Credit Cards, Cash Payment through e-Challan at branches of SBI. No fee for SC, ST, PWD, Ex-Serviceman and departmental candidates. 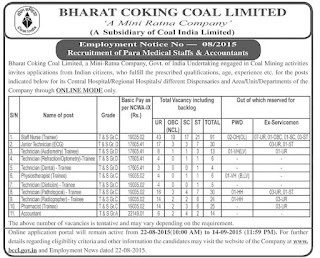 How to apply: Eligible applicant require to apply online through bharat coking coal limited website www.bccl.gov.in from 22.08.2015 at 10:00 hrs. To 14.09.2015 by 23:59 hrs. & send hard copy of online application (Registered Application Form) along with self-attested Photocopies of relevant documents through ordinary to Post Box No 9248, Krishna Nagar Head Post Office, and Delhi-110051 on or before 24.09.2015 by 23:59 hrs. 1. Log on to the bharat coking coal limited website www.bccl.gov.in. 6. Make the payment by online or SBI-i -Collect option” with SBI Internet Banking, other major bank’s Internet Banking, Debit, Credit Cards, Cash Payment through e-Challan at branches of SBI. No fee for SC, ST, PWD, Ex-Serviceman and departmental candidates. Examination Centre; A candidate should select any one of the following examination center while filling the online Application Form.